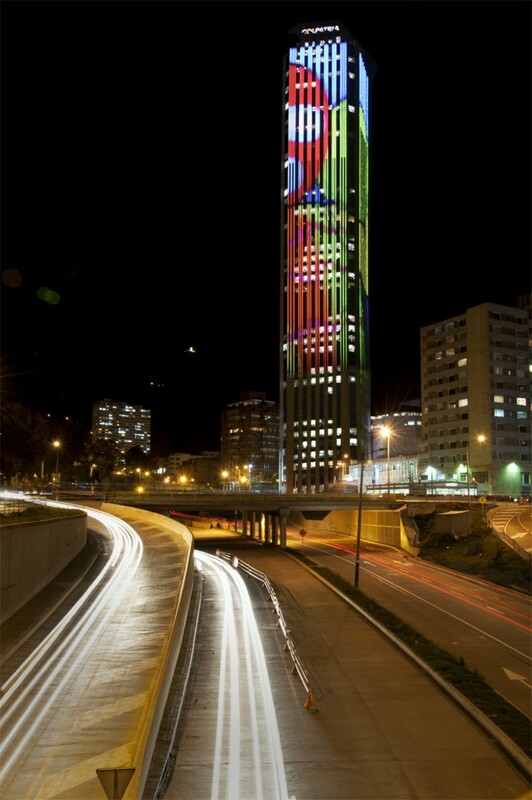 With 49 floors and a total height of 196 meters the Colpatria tower is the highest building of Colombia. It is in Bogotá, the capital city, and since its completion in 1979 it has always played a predominant role in the city’s landscape. The viewpoint at the top of the tower lets appreciate the extension of the city in all four directions. The tower was first illuminated in 1998 with color lights. This system only allowed to change the colors of the tower and create some basic compositions. 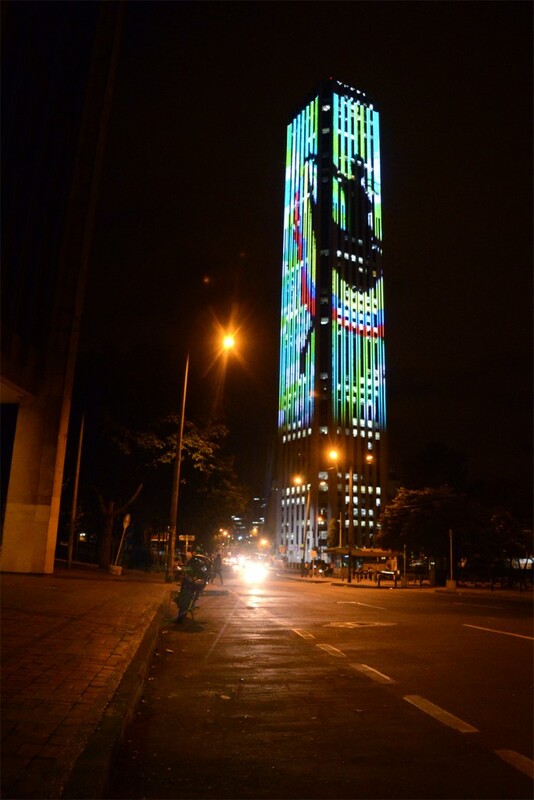 However, in 2013 the tower became a new LED system that allows the display of pictures and videos. The resulting media facade is 120 meters high and covers the area between the 12th and the 46th floors. The LED lights are mounted in a custom-made metal profiles that is fixed with pressure nails to the facade of the building. To protect the electrical installation, the metal profiles are waterproof. The new system can be controlled in different ways. For example it can be used together with DMX technologies or it can be also be controlled and monitored through a web-based interface. 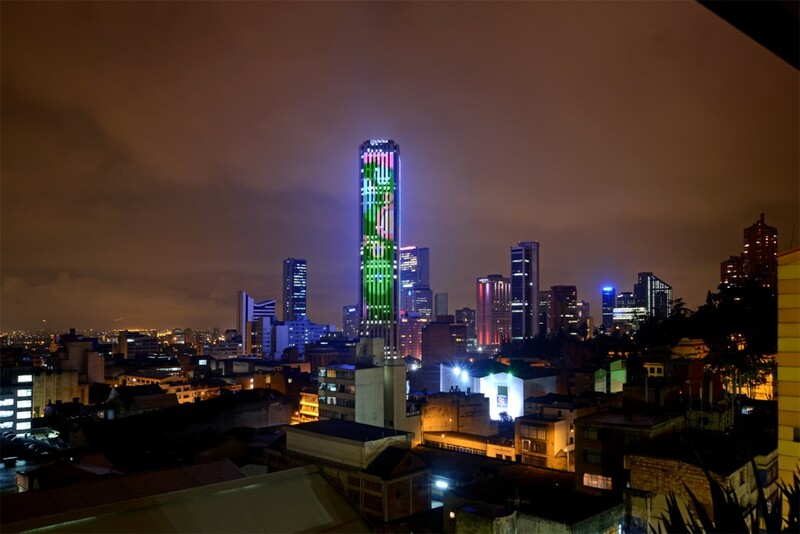 As the Colpatria tower has a key role in the city’s landscape, the media facade can be seen from very long distances. For example it can be appreciated from Moserrate or Guadalupe, two of the Andean mountains at the east of Bogotá. It can be also be seen from many other places in the city, as Bogotá is build upon a large plateau. This gives this tower an enormous potential for cultural producers and urban media activists. This potential, however, is still pending to be explored. You can watch a promotional video here.